Back in the early releases of Jelly Bean, Google introduced a new command to adb called “sideload.” Using the sideload command, and the newest version of adb from the Android SDK, one could update their Nexus device through stock recovery, without having to root or flash a custom recovery. It’s something we wish was there from day one, however, at least we have it now. And I know that many of you feel that Nexus devices shouldn’t ever have a stock recovery and that they should be hacked on daily, but try to keep in mind that some like Nexus phones and tablets because of constant updates and a 100% stock version of Android. As someone that has a decent grip on drivers and adb, I have to admit that adb sideload has given me issues since it was introduced, which is why I have yet to fully write a guide about it. But with today’s Android 4.2.2 update becoming available, I decided to take a second look at the process and finally found some solutions to the issues that have taken hours away from my life. One had to do with my device ID not registering through the USB driver, requiring a manual edit of the “winusb.inf” file. The other was a Windows 8 security issue that wouldn’t allow me to install drivers that had not been signed, which is something that happens after you start manually editing driver files. So for those that keep it stock and still want to update early with the cool kids, this guide is for you. Below, you’ll find the instructions to adb sideload, with extra posts coming later that will help with some specific issues that I ran into. 2. Plug in your device to your Windows machine. Make sure USB Debugging is enabled. 3. To test that you have adb up and running, and that your device is recognized, open a command prompt. 7. If you see something along those lines, your adb is working properly, for now. 8. Download the update.zip from Google to your PC that you would like to install on your Nexus. 9. Move the file into your Platform-Tools folder. 11. Your device will now reboot to the bootloader. 13. Select it with the Power button. 14. Your device will boot to an Android logo with a exclamation mark. 15. To jump past this, press Volume Up and Power at the same time. 16. You will now be in stock recovery. 17. With Volume Down, highlight “apply update from ADB.” Press Power to choose it. 19. If your adb is working properly, you should see the file transfer to your device in adb. 20. Once that finishes, your device will begin to update. 21. Once it has finished, simply reboot and enjoy the update. 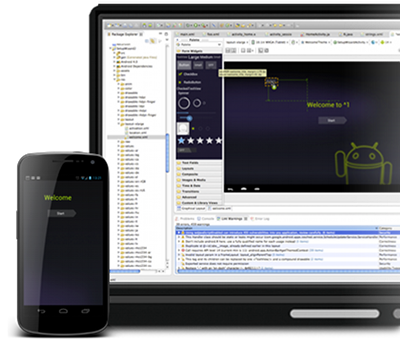 If you didn't download the Eclipse ADT bundle, go download the Eclipse ADT bundle now, or switch to the Android Studio install or stand-alone SDK Tools install instructions.